Several years ago, my wife, Carla and I took a 2,000-mile cruise on a ferry up the inside passage of southeast Alaska with an Elderhostel group. Usually I read books about an adventure before I go, but in this case, I didn’t do any studying of the area or the people before we left. I started with few expectations. There are advantages both ways. If you know more, you get the nuances of things; if you know less, you’re surprised more often. My lack of preparation meant that every speaker was giving me new information and every town we walked through was a novel experience. I knew a fair amount about the plains Indians, but nothing about the Tlingit who are among the most culturally advanced of the tribes. Their art work and social system were very sophisticated. The Tlingit Indians were my most fascinating find. Before Europeans came, they controlled most of what is now southeast Alaska. Because of the ease of finding food - when the tide went out, their table was set - they had free time to develop a sophisticated culture with a high level of art. Other foods were also readily available, and seal and game were close seconds salmon in their diets. Their good diet resulted in a tall, healthy people who were feared warriors. The Tlingit controlled the trading in an area that extended south to Oregon, north and inland. 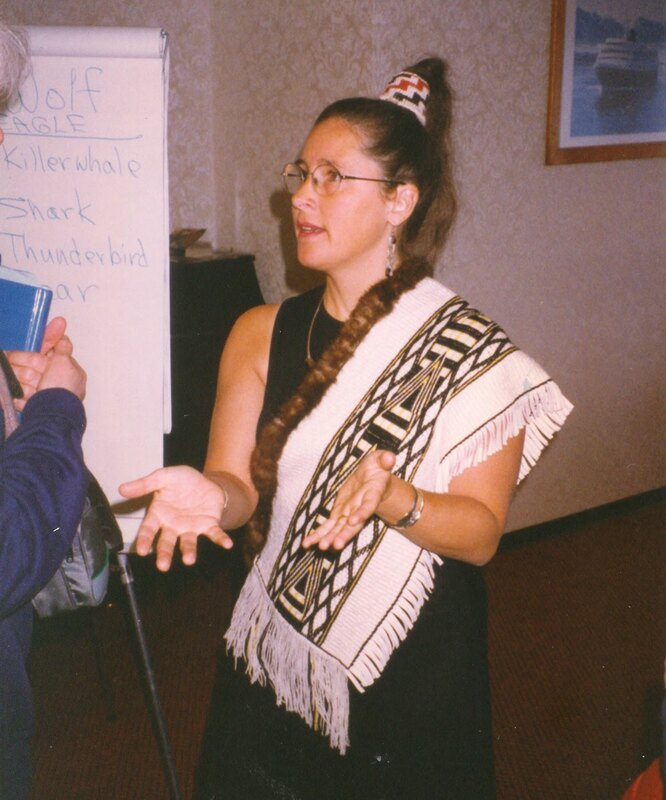 One of our instructors, Terry, a Tlingit woman was very enthusiastic about the beauty of the life of the Tlingit Indians and was very involved in showing their culture to us. They also had beliefs that made them susceptible to Christian missionaries. The missionaries saw much of the culture as pagan and, without understanding what it meant to the Tlingits, set out to destroy it. For example, totem poles serve a variety of purposes for the Tlingits, none of them religious, but missionaries saw them as idols, so their manufacture was forbidden. It didn’t help the culture’s survival that 80 percent of the Tlingit died from smallpox and measles introduced by traders. Our instructors Terri, was rediscovering the native art forms. She gathered bark and roots to make baskets and wool to weave intricate Chilkat blankets, which can take a year of full-time work to make. Although the results were great, I wouldn’t have had the patience to dig up a 50-foot root and split it lengthwise into the tiny strands she then wove into waterproof baskets. They are also known for the quality of their wood carvings, especially ceremonial masks. The prices on the baskets and blankets along with carvings such as masks and totem poles are so high that only rich patrons and museums can afford them. 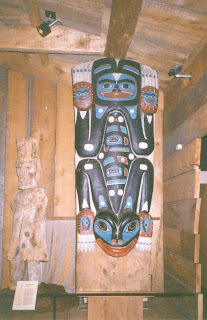 A totem pole is $1,000 per foot if done by an ordinary artist, $2,000 if done by a well-known artist. Ninety percent of southeast Alaska is made up of Tongass National Forest, and not much land is available for private residences. As a result, the price of a home is high. Places that looked little better than shacks cost $160,000. We didn’t see housing in any of the towns that looked upscale to us. There is an old-fashioned, rough-and-ready appearance to the towns, as if they were newly built, temporary dwellings for people who expected to move before long. The village of Wrangle didn’t even look worthy of being a spot in history. The only thing that gave it any class was the totem poles and native habitats. Despite the shoddy nature of the towns, the people who live there love it. It’s never too hot or cold; there are still berries, lots of fish and shellfish, 10,000 islands, and lots of water around you and often coming down on top of you. When I do relaxation exercises with clients and ask them to imagine a comfortable place, they pick a water scene. Southeast Alaskans can just open their eyes - the relaxing scene is there in front of them. Russians exploited the area for sea otter the skins of which brought an unbelievable high price. When they had killed off most of the otter they sold us the “useless” land. While they fought with the Tlingits it was a Spanish trading ship that decimated the Indians by unknowingly bringing in the small pox and measles that killed a majority of the locals whole villages at a time. This made them lose faith in their shaman’s who didn’t know how to treat these Old World diseases and most of the Tlingits were easily converted to Orthodox Christianity. After the United States got the land, the Tlingit put up a totem pole ridiculing Abraham Lincoln because he made them give up their slaves and gave them nothing in return.